Last week I finally managed to get to see the amazing Mundolingua - the language museum in Paris founded by Mark Oremland a couple of years ago. I don't use the adjective lightly. He has managed to pack into two floors of a small building a remarkable array of pictures, books, artefacts, and interactive facilities relating to language, languages, and linguistics, all presented in a user-friendly and multingual way. I had a personal interest in making my visit, as Mark describes his museum as a three-dimensional representation of my Cambridge Encyclopedia of Language. That may have been the starting-point, but in its range of illustrations the museum now goes well beyond what is in my book. And the ingenuity of the presentations has to be experienced. Mundolingua is a must-see. It's on the south bank, and easy to find. Aim for the church of Saint Sulpice. Stand in front of it and Rue Servandoni is just around the corner on your right. A few metres down and Mundolingua is on your right. At the other end of the street are the Luxembourg gardens. The museum is open every day between 10:00 and 19:00, with a modest entrance fee of just a few euros. Don't rush the visit. There is so much material that a language buff could spend a whole day here - or even two - exploring the collections in detail. The day I was there a group of visitors was sitting around a sociolinguistic exhibit with headphones, happily listening to usages in various languages. Another couple was by the phonetics chart copying the IPA sounds represented there. Mark has succeeded where other language museum projects, conceived on a larger scale, have failed. In a post on this blog in 2013 I described some of them, all of which have not gone ahead, usually for lack of financial support. Mundolingua is the exception, and it needs all the support it can get. The day I visited there were quite a few people looking around, but there are days, I was told, when there are no visitors at all. So spread the news. Tour Eiffel? Tick. Louvre? Tick. Mundolingua? Tick. I am an A Level English Language teacher and I am planning a visit to Paris, between Christmas and New Year. So thanks for giving me a tip to fill up my exploratory itinerary! Thanks. I'm sure you'll enjoy it. I am back in Europe after 6 years in Peru. 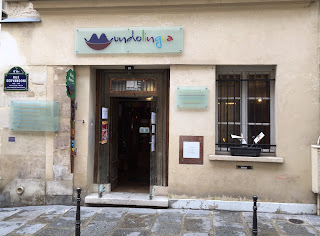 Mundolingua is now on my list of things to do! Thanks David for sharing this.